Littered on the bottom of the Great Lakes are the remains of more than 6,000 shipwrecks gone missing on the Great Lakes since the late 1600s when the first commercial sailing ships began plying the region, most during the heyday of commercial shipping in the nineteenth century. The vast expanse of these inland waterways provided a natural transportation system linking the Midwestern states and portions of Canada to the rest of the world. CLICK HERE for a menu of maritime losses in the southeast quadrant of Lake Michigan. Unpredictable weather makes them some of the most dangerous waters in the world. Sudden storms, fire, and fog have resulted in the destruction of these many thousands of vessels. Just over twenty percent of those vessels have come to rest on the bottom of Lake Michigan, second only in quantity to Lake Huron. Heavy passenger and cargo trade to the cities of Chicago, Milwaukee, and the many small lakefront communities on the eastern and western shores, combined with the prevailing northwest winds that have the full 400-mile length of the lake to build, conspired to end the careers of almost 2000 vessels and the lives of thousands of people. Several hundred of these vessels—mostly hard-to-maneuver sailing crafts—have been the victims of the raging winds and currents that pounded them into kindling along shore. However, many hundreds more were lost in deep water far offshore. 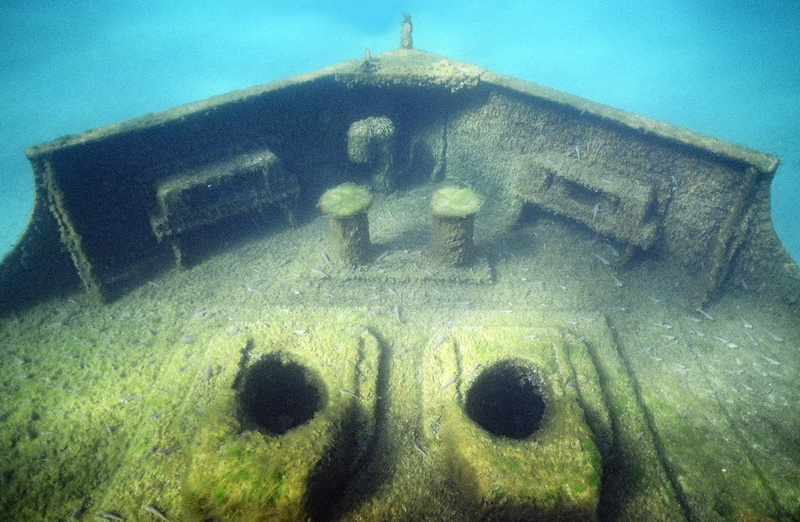 To date, only some 300 shipwrecks have been found beyond the surf line in Lake Michigan within the state waters of Wisconsin, Illinois, Indiana, and Michigan. Many more await discovery. While the passage of time obscured these shipwrecks, they usually were not forgotten. When equipment for searching and diving became available and affordable following World War II, early explorers sought out these shipwrecks in order to recover artifacts for personal collections or to sell to others. The media regularly reported the feats of these diving pioneers and when the public had the chance to see shipwrecks brought up piece by piece, excitement and interest grew. When underwater motion picture and still photography became available to recreational divers in the late 1970s, they had the means to share their conquests through imagery in addition to the artifacts they found. A number of film festivals cropped up around the Great Lakes and the sport of shipwreck hunting and diving increased exponentially. More and more shipwrecks were found and many more artifacts were recovered. The pictures, worth the proverbial “thousand words,” provided the media with even better ways to convey these exciting stories of adventure and discovery. Although the divers got great enjoyment (and sometimes cash) for the artifacts, archaeologists and historians eventually took offense at the loss of historical data that occurs when an object is recovered without proper documentation or conservation and parceled out to private collections. 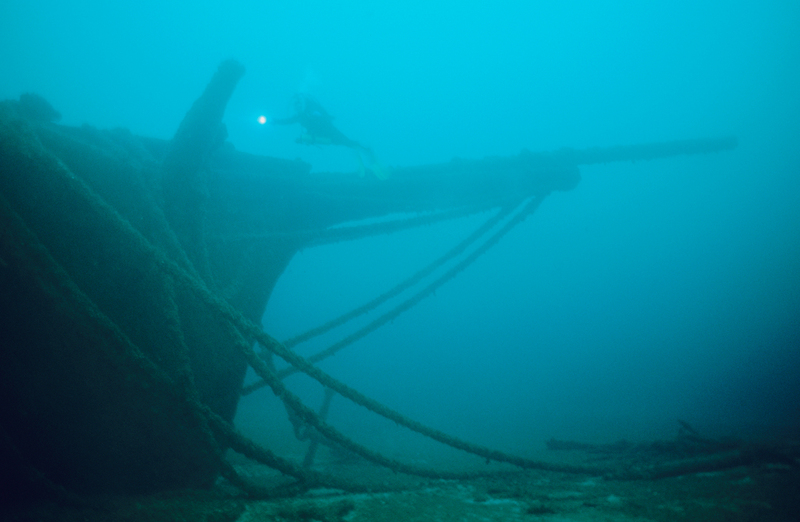 The same technologies that served to make shipwreck diving possible also provided archaeologists the tools to work underwater, generating a whole new movement in the Great Lakes. At this same time, divers also began seeing how they were destroying their own dive sites. 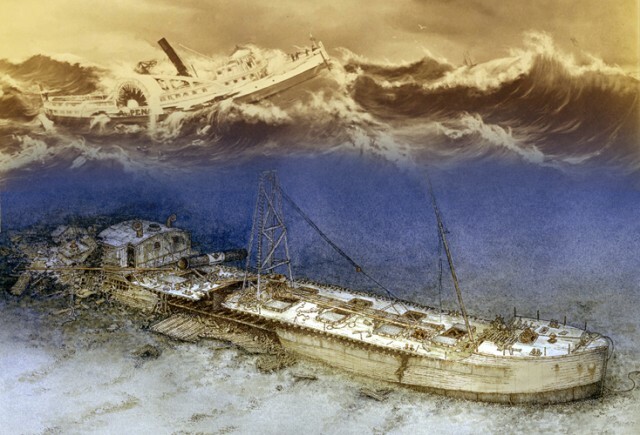 By 1987, President Ronald Reagan signed into law the Abandoned Shipwreck Act, claiming ownership of shipwrecks and in turn, turning that ownership and management responsibility to the individual states on whose bottomlands the wrecks rested. Each state then enacted laws, all making it a felony to remove artifacts from or damage a shipwreck. MSRA was founded a number of years after the establishment of these new laws enacted to protect shipwrecks for all the various groups having an interest, or “stake” in them. The organization represents a number of those stakeholder groups, including recreational divers, charter boat operators, archaeologists, historians, and museum specialists as well as the public. MSRA views shipwrecks not only as recreational dive sites but as laboratories for archaeologists, historians, and scientists. Shipwrecks can provide the data that can solve the mysteries of their sinkings, they offer up information that allow writers to pen the final chapters of these vessels’ careers, they generate exciting information to share with the public and create the impetus to develop museum exhibits. Believing that a new shipwreck discovery provides the “hook” to study Michigan’s maritime past, MSRA conducts research in order to find the wrecks, mounts an annual search expedition, discovers shipwrecks, documents the sites, and interprets them for the public. MSRA’s initial area of focus has been the southern quarter of Lake Michigan within Michigan waters, although MSRA will work outside those boundaries. This portion of the web site is divided into four sections as listed in the upper right where you can explore both the lost and found wrecks of eastern Lake Michigan.